Yes, â€˜tis the season to be jolly, to express the love we have in our hearts every day but through the bustle and business of the daily grind, sometimes forget to share. Letâ€™s make this Christmas the Christmas we remember for all the right reasons. The days of summer loving taking life in the way we talk with our babies; the generosity of the time we give as parents; the opportunity to lay another plate at the table; taking every moment to smile, to laugh, to help, to give. The words on the most glittery hallmark card are actually the lesson of instruction that we might all pay attention to over these days when so many of us, finish at the office, hang up our workboots, and put the phone on the charger. The holiday season is a perfect time to look back and reflect on the achievements of the last year, and dream of new opportunities ahead. We got our holiday thinking off to a good start by sending some time with the â€œedu-tainmentâ€� of Pio Terei from Awesome Parenting. Pio and the team at the Parenting Place are looking at ways of addressing the â€˜poverty of spiritâ€™ that can sometimes take away from our ability to build awesome whÄ�nau. One of the stories I liked the best was the parable of the paru water. If you look at a glass of dirty water â€“ where the sentiments are polluted and swirling with dirt â€“ one approach could be that you tip it out and end up with nothing. A more effective way is that you flush out the bad with plenty of fresh, flowing pure water until eventually all the dirt is washed away. Thatâ€™s a great way to think about WhÄ�nau Ora â€“ filling our glasses to overflowing with the good water, so that we are all healthier, stronger, better off. Weâ€™re keen to spend some more time with his team and learn about the tools and techniques that we can use to nurture our children and ourselves in the name of family. It was the week for some wonderful surprise guests popping into the Christchurch offices of Te PÅ«tahitanga. Hon Te Ururoa Flavell came in for a Christmas lunch with the wider team at our hub. He came to Christchurch to fulfil a promise heâ€™d made earlier in the year, that he would come back to catch up with TÅ« Pono: Te Mana Kaha o Te WhÄ�nau â€“ the initiative we have been involved in to help confront and address family violence in our midst. We talked about the value of a 'calm and respect' approach, as opposed to a 'control and restraint'. Calming the hulk â€“ finding out what is the real stem of the issue; is it something someone said; is it thinking about loved ones no longer with us, or just stepping back and waiting, to be there, rather than rushing the issue and hyping the tension. We talked about putting the meaning back into the phrase, aroha ki te tangata. How do we truly become positive role models for all our mokopuna? If there is one lesson we know well out of WhÄ�nau Ora it is that it takes a whole whÄ�nau to look after each other. Ultimately we have to all become whakapapa warriors: champions of our own families; remembering that no-one deserves to be violated, that there is no high like the natural high of whÄ�nau togetherness. We started off this last week of the year in Waiharakeke- the land of long golden summers. I spent five years of my childhood growing up in Blenheim so I always have a slightly rosy view of the beauty that lies within this community. But Iâ€™d have to say Mondayâ€™s visits around Te RÅ«nanga o NgÄ� Maata Waka ki te Tau ihu; Rangitane ki Wairau, Hauora o NgÄ�ti Rarua and Te Rito Hiranga o Wairau (Marlborough Research Centre) reinforced my bias that the sun is always shining in Wairau! We had a fabulous morning being allowed to visit a couple of the local whÄ�nau homes who shared their stories with us about making life better for their whÄ�nau by virtue of the magic of maara kai. It was so moving to spend some time with Tizzy and her tribe of tamariki, as they showed us how green their garden grew. As this young mum talked about the path she was following to become ko kakama mahinga kai, it was obvious to see that there was much more at stake than simply transferring young seedlings from pottle to plant. She was so proud of her progress in growing from seed; in mastering the art of tendering and nurturing; in the momentum of manaakitanga. While Mum was showing us her silver beet and brocolli, baby girl was taking the moment to demonstrate her talents in handstands. There was so much pride oozing in this backyard! We then went to spend some time with Matua Shane, who while loving and looking after his mokopuna has cultivated a garden overflowing with tomatoes, kamokamo, puha and even a very special Christmas tree! 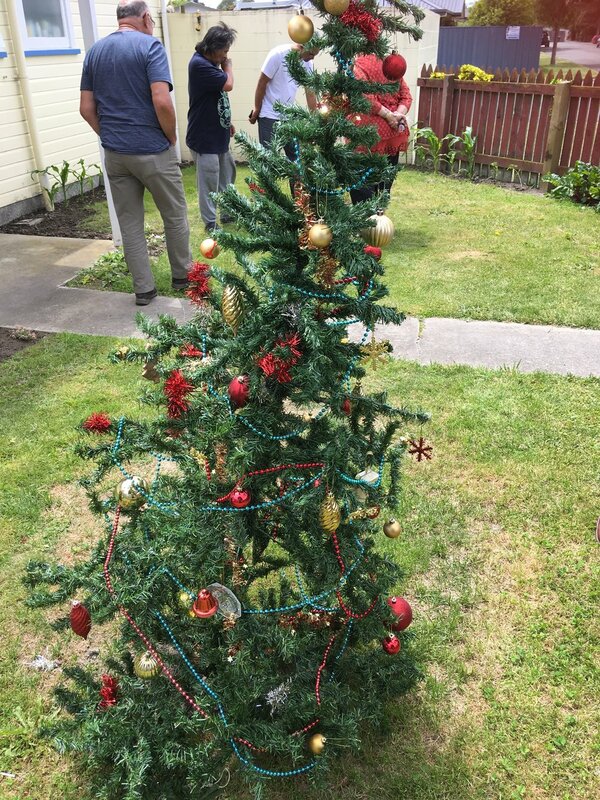 It was wonderful to have our Board Chair, Matua Norm Dewes and our Te Taumata Chair Whaea Molly Luke, along with Board member Trevor Taylor, and Maara kai champion, Dr Richard Hunter, spend the day seeing some of the positive changes that whÄ�nau are making in their gardens, their homes, their lives. Back to the office we went in Christchurch, to receive a surprise Christmas visit from TÄ� Mark before he headed off on holiday. Thatâ€™s one of the greatest gifts of this time of year â€“ is people popping in to catch up on moments together that havenâ€™t been so easy to get throughout the year. And so, now as 2016 slips towards the new year, it is time for us all to reach out to you â€“ to say thank you for allowing us to share your experiences, to wish you a very happy Christmas and to encourage us all to be kind, be loving, be whÄ�nau. Representatives of our GPL Board, Parekawhia McLean and Donovan Clark, on either side of two wahine toa â€“ our WhÄ�nau Ora champion, Cazna Luke and Commissioning Manager, Maania Farrar. Thank you for the challenges you take up so bravely; the determination you show towards finding solutions to some of the more enduring issues, and the commitment you make towards shaping a better tomorrow for all of us to celebrate. I have one last story to leave this year with â€“ and it involves two little boys and a kÅ�whai seed. And most important of all â€“ WhÄ�nau Ora is about planting inspiration which can flourish in conditions ripe for growth. This week I got an email from one of our applicants who was selected in Wave Three with an initiative she called Soul Full Superfoods. Katie Robinson has a dream to create a healthy food revolution within our whÄ�nau . Soul Full is about providing healthy, fun food choices for our whÄ�nau to fuel their soul, body and mind. A key means of doing this is decking out a four metre food trailer so they can provide colourful smoothie bowls and other food options around the community, where-ever they are. That was all great â€¦..except the trailer had to come from Te Awamutu â€“ and with the earthquakes of 14 November, there wÄ�s no way that trailer was getting here fast. Katieâ€™s had a few challenges along the way but nothing will stop her from getting that superfood strategy out there and so we can expect to see those colourful smoothie bowls around town in a couple of months from now. When she sent me an email of her progress, Katie also enclosed a photo of the kÅ�whai tree that she had planted from the seeds at the symposium in July. I have to say it filled my heart with joy â€“ to see the boy with the cheshire grin; the pukana son and the radiant new life of that tiny kÅ�whai tree. It tells me everything about what we believe in: hope for our babies; the promise of new opportunities; the power of love. Descended from a line of chiefs, He kÄ�kano ahau. Meri Kirihimete me nga mihi o te tau hou.